Our subconscious mind thinks in images and symbols and feelings. Long before our left brain comes up with the words to describe what we are thinking, symbols and sensations have already arisen in our right brain and body. Words come later. So it can be very useful to first let the intuitive, imagistic right brain (which is associated with our left hand and body) have a chance to play. What are some of the symbols that reflect what is important to you? Are there certain animals that represent qualities that you identify with? How easy it is to depict a crow by just making some black winged marks. Symbols often have culturally accepted attributes like water reflecting emotion and ships conveying a voyage. Take a little time to identify some simple symbols that you can experiment with that evoke qualities you identify with. 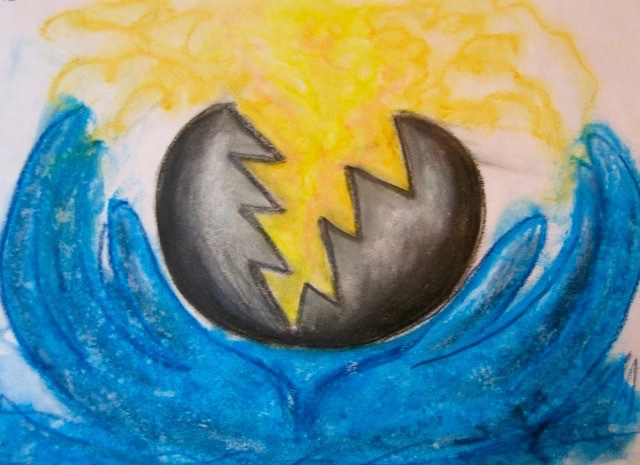 My own art has been filled with eggs cracking with light spilling out ever since I had a profound energetic awakening experience. That is the power of the subconscious mind and the symbols it can bring up to give us signs and clues and even guidance. Trust that your Higher mind knows how to bring these through for your highest good.